Email marketing is a great way of promoting your business at little expense. But it has to be carried out accurately to grab the attention of your reader. We all receive a ridiculous amount of marketing emails, so we (even us as a marketing agency) can understand how easy to ignore they can be. The challenge is to create an email that stops the busiest of workaholic’s in their tracks and have them take the time to read your email. So, which campaigns have succeeded in doing that in the past? Which emails are so good that you not only open them, but you share and remember them. Here are some of our favourites. One way of capturing an individual swamped in home or work life is simplicity. Many don’t have time to enjoy your creative talents, finding the hidden message between the lines, and appreciating the vibrant design. 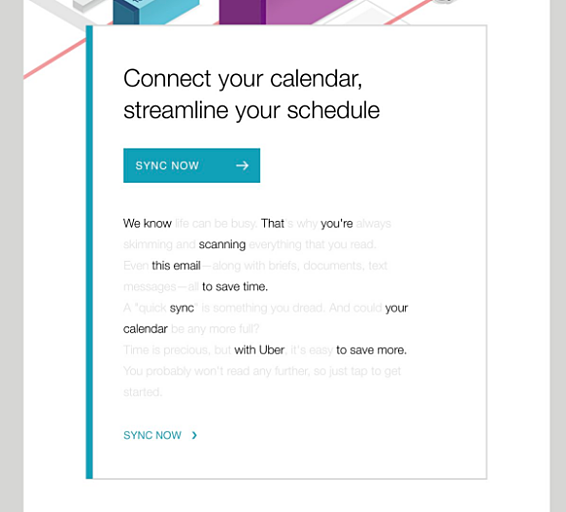 Instead, Uber’s marketing team understands that many of their customers will only be able to skim read their emails. Their email is straight to the point with a clear message, illustrating that you can be ridiculously direct through email and people will appreciate you not wasting their time. An alternative approach is to keep the simplicity but go bold. Catch the customer’s eye with a hilarious GIF, after all who wouldn’t look twice at a colourful moving image jumping around your inbox, when every other email probably lacks an image or video, let alone a GIF. Postmates, an American food delivery company, automatically draws in your attention with the vibrant GIF of guac and nachos, quite literally getting closer and then further away from you. The design of the email directs all attention towards the food, making delivery look easy and deliciously inviting. Animated GIFs can be useful in capturing a reader’s original attention and can direct their eyes towards a particular selling point. Another tactic in email marketing is to provoke slight emotion in the reader to help get your point across. Often, marketing emails target reactivating their customer’s interest with a new deal. A key way to attract inactive users is to make the email personal but not serious. Missguided’s reactive campaign is a perfect example. They draw on the simplicity of design to concentrate on the fundamental message of the email. By writing in a colloquial and personal fashion it enhances the guilt of the customer. The comedic notion of Missguided truly missing one individual customer can be seen by the caring and hyperbolic language used. One strategy of attracting customers is to create a campaign that resembles an actual conversation. Kate Spade creates a personalised element causing a customer to feel more attended to, with the dialogue design automatically generating a more friendly look. A slightly different approach to involve a customer is to show off your brand's personality from the very beginning, for example in The Hustle’s welcoming email. 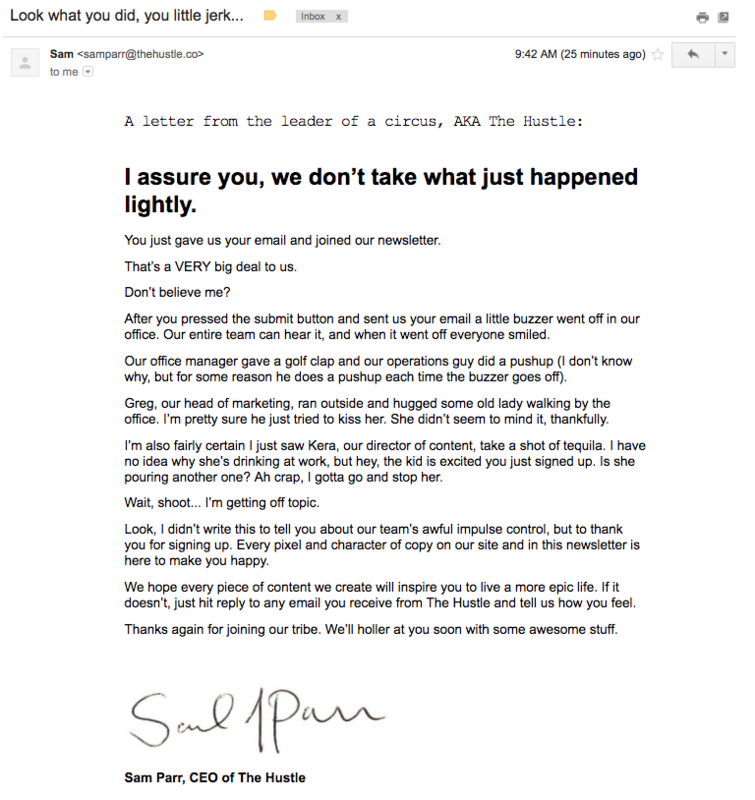 Although it lacks the simplicity and direct nature of the earlier email marketing campaigns, the Hustle is able to convey their slightly ridiculous and sarcastic demeanour throughout their comedic email. The Hustle captures your attention, if you read the first few lines it fully engages your mind, picturing the circus that is their office. Illustrating your brand’s personality through an email campaign can be tricky but absolutely vital in pushing the customer to open the email and give it their attention. For example, if this email showed up in your inbox, the ‘subject’ of the email (“look at what you did, you little jerk”) would definitely persuade a customer to open and read the email, whilst providing a representation of the company. Another example of a campaign attempting to re-engage inactive customers is Paul Mitchell’s marketing emails. The company focuses on drawing out emotion from the reader in a comedic nature but equally capturing the ‘last chance’ notion to help secure customer loyalty. J.Crew Factory recognised the well known problem of wrapping gifts that their customers face and used it to their advantage in their email marketing campaign. The comedic image in turn with the direct text provides a clear solution for a common problem. The email is also dummy proof, with a step by step process on what to do and exact directions of where to get it, reducing any purchase restriction. How do your marketing emails compare? Are you capturing your target audience and drawing in the attention needed? If not don't worry. Everyone knows in marketing how difficult it is to get a response from direct emails. We get frustrated with them ourselves. So take some tips from the style, design, and tac-tics of these email campaigns to make your emails both entertaining and smart.